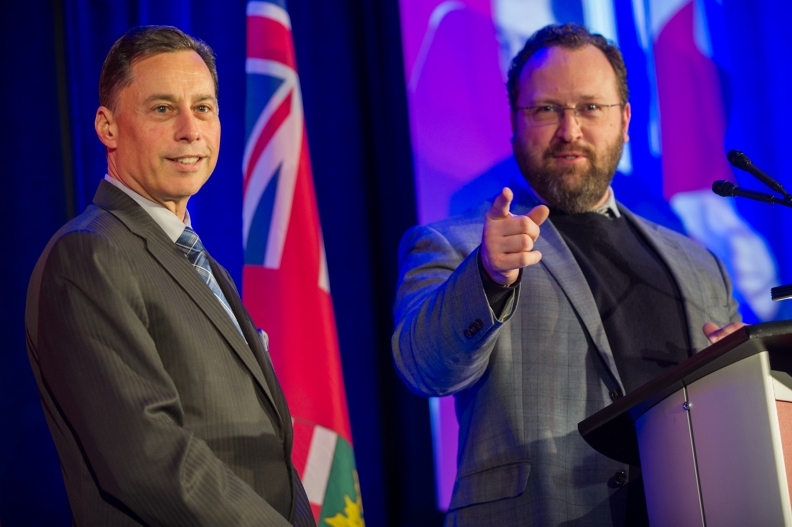 Ontario Economic Development Minister Brad Duguid, left, says the province is listening to Automotive Parts Manufacturing Association President Flavio Volpe and his members when it comes to energy costs. The Province of Ontario plans to work with medium-sized auto parts manufacturers to see if it can “provide them breaks on their energy costs,” says Minister of Economic Development Brad Duguid. It’s a concern from top to bottom in the auto industry. Magna International CEO Don Walker told the Automotive News Canada Congress audience on Feb. 17 the company spends $80 million on electricity every year, “and those numbers are a couple years old,” he said. “I can’t talk about anything in Ontario without talking about electricity,” he said during his speech. “We have been lobbying for some time now to get some relief for companies who use a significant amount of power but don’t meet the large-power user descriptor,” Volpe said. On Jan. 1, Ontario tweaked the Industrial Conservation Initiative (ICI), an incentive program for larger electricity users. It now allows for about 1,000 more large energy users to qualify for incentives to reduce their electricity bills. “By simply enrolling in the program, those 1,000 companies could each save 14 per cent on their bill. Depending on their ability to reduce peak electricity consumption, they could save up to 34 per cent,” according to the province’s website. Because Ontario uses time-of-use pricing for its electricity, meaning it’s cheaper at night than during the day, manufacturers only receive the larger ICI discount if they shift their production to a time of day when electricity use is not at its peak. Duguid insists the ICI program provides companies “with significant savings and puts them, at worst, in the middle of the pack in terms of electricity costs” when compared to other places. Many mid-size manufacturers fail to qualify for the ICI because their monthly peak demand for electricity isn’t greater than one megawatt. And many of those same manufacturers don’t qualify for a new eight-per-cent discount that went into effect Jan. 1 because they use more than 250,000 kilowatt-hours of electricity per year and exceed a monthly peak demand of 50 kilowatts. Volpe said his association has had conversations about electricity with the government for the last couple of years. Volpe said the situation isn’t “make or break, yet” for most companies that don’t receive a discount or incentive. She said her November electricity bill at Automatic Coating in Toronto, was $45,000 but that only $5,600 was for actual electricity. The rest was for delivery and global adjustment fees and more. “We’re not cost competitive with other jurisdictions,” she said. The coalition wants to see the government offer industrial electricity rates, renegotiate contracts with green energy producers, benchmark costs with other jurisdictions and use money generated through a cap-and-trade program to offset electricity costs, among other things. According to a Toronto Sun report, the government intends to dedicate some of the proceeds from its cap-and-trade program to keeping electricity rates affordable for business. The Ministry of Energy didn’t immediately respond to an interview request.